It’s what we all long for, what we all plan for. We dream of falling in love with the ideal person and having the ideal marriage, with 2.5 ideal kids and an ideal golden retriever, living in an ideal home with an ideal picket fence and ideal car parked in the drive way. We plan for the ideal college to accept us with the ideal amount of financial aid and an ideal degree which will lead us to an ideal job field where we can use our talent to advance our ideal career. The ideal is defined as: a conception of something in its perfection. I don’t think there’s anything wrong with desiring the ideal. I think God wants that for us. He wants our marriages to be strong and healthy. He wants our kids to feel loved and well cared for. He wants us to use our gifts and talents to contribute to our community and provide for our needs. He is the God who promises us “abundant life”. But we live in a fallen world and sadly, the ideal is usually more of a concept than it is a reality. We know that the ideal is for kids to be raised by a mom and a dad. But what happens when that’s not the case? When one parent leaves, or when a parent dies? We know that the ideal is to work to provide for our family. But what happens when the company downsizes or there’s no open door to use your hard earned degree? What do we do when the plans we had for our lives don’t quite measure up to the reality of the life that we’re faced with. In the last twenty years I’ve told my kids countless times, “you are not a statistic, you are a child of the most high God.” It came into play in so many conversations. Drug use, alcohol use, teen pregnancy, self-harm, suicide, depression, leaving their faith, falling into sin… all the statistics that were thrown at my kids I combated with a sentence that I believed with all of my heart, YOU are NOT a statistic, you are a child of the most high God. This belief didn’t deny the very real possibility of having to face every one of those statistics, but it did remind my kids that they are not who the world tells them they are. Their life is defined by who God says they are, and His plans for them. Then I found myself a single mom and I started reading about the effects on kids growing up without a father. Without the ideal two parent home. As a read and researched I realized that the ideal was lacking in my home and there was nothing I could do to change it. Suddenly there was a void. There was a quiet whisper of “it’s not supposed to be like this”. There was an underlying fear of things going terribly wrong because the ideal had slipped through my fingers. What would be the effect on me? On my kids? And there it is… abounding grace. Not condemnation. Not blame. But grace. Poured out in abundance. I think that even though abound means “to occur or exist in great quantities” we oftentimes miss it. I think abounding grace shows up in millions of tiny ways as opposed to a few great big ways. I think abounding grace shows up when a teenage son holds the door open for his mom and says “you look nice today”. Abounding grace shows up when the bill was $20 less than you had planned for in the exact same week that your child needs $15 for an art fee you knew nothing about. I think grace abounds when you show up to work and someone left a piece of your favorite chocolate on your desk, or you walk outside to take out the trash at the exact moment that the sky is on fire and the glory of the sunset takes your breath away. Grace abounds in laughter around the dinner table, hugs at bedtime, “I love yous” in the mornings, the steaming mug of hot tea, the gift of deep sleep, a kind word from a stranger, or the perfect song at the perfect time. Look around… where is the ideal lacking in your life? It’s easy to see. It’s probably glaringly obvious. 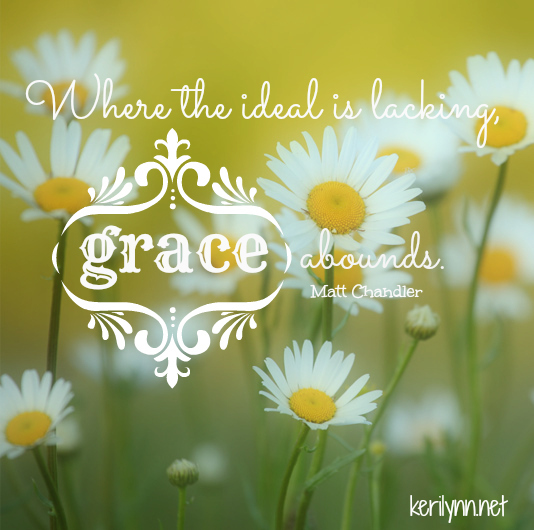 What’s not so obvious is abounding grace, but it’s there too. Lean in, look harder, slow down. Lord, open our eyes to see! To see Your grace abound in the places of lack in our less than ideal lives. Q: Where have you seen grace abound in your life?